Note: Henri-Paul Rey was born in Pesmes, France and was a sculptor who worked in stone and wood. He also created a large number of ceramic works. Rey studied at l'Ecole des Beaux-Arts in Besancon (1925-1927) under Georges Laithier and Leon Tirode, and studied under Bouchard, Injalbert, and de Villiers at l'Ecole National Superieure des Beaux-Arts (1927-1933) where he learned the valuable techniques that would characterize his original works. Rey knew how to impose his own style right away in his sculptures without years of experience or outside influences. Rey's work, both bold and aesthetically pleasing, was already appreciated before the war. He exhibited a base relief wood sculpture in the 1937 Paris l'Exposition Internationale at the pavilion de Franche Comte and a similar 'Tree of Peace' in the 1939 Exposition in New York. Rey also exhibited regularly in the Salon des Artistes Francais de Paris where he received a gold medal (1937) silver medal (1933) and bronze medal (1932). He was also a member of the jury of the Salon des Arts Decoratifs. His works can be found in museums in France, United States, Canada, and Poland as well as other international institutions. Rey was a second-generation Cubist. He created works based on music and dance, including some monumental woodcarvings. He worked from stone, but found carving from wood to be more synergistic to complement his emphasis on form and volume. He worked meticulously with thoughtful execution and exuded a certain powerful maternal tenderness in his rounded totems carved from tree trunks. His work expresses emotion and sensibility that is emphasized in the miracle of old wood, brought to life by art. 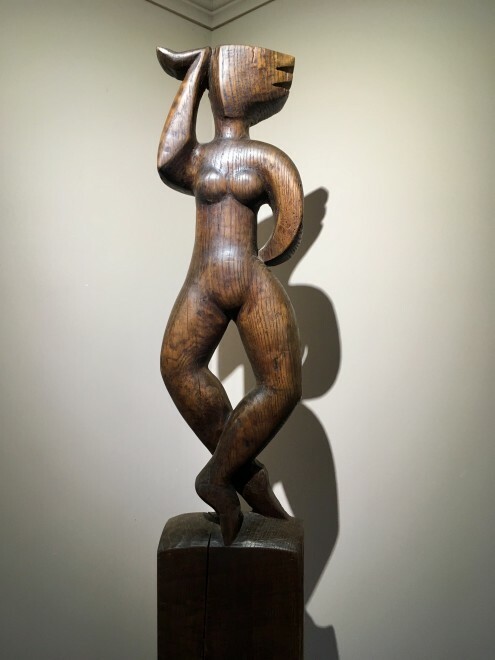 Like many of the earlier Cubists, he incorporated African imagery in his spectacular sculptures. Although Rey's work can be found internationally, his predilection remains in his home region where we can find monuments such as Saint Ferreol and Saint Ferjeux in the crypt of the Basilique of Monseigneur Dubourg, of Louis Pergaud in Marcheville or the Virgin of Buis in Besancon where the monumental sculpture (7 meters high) integrates religious art at such a splendid site, dominating the town! The magnificent Church of Pesmes, also rich with Rey's works, also has Saint Hilaire sculpture. Rey is also noted for making busts and medallions of famous writers, painters, Ecclesiastes, politicians, and scientists including Louis Lumiere, Edouard Belin, Louis Guignard, President Jules Grevy, Pontelin, and Cardinal Binet. Rey was also awarded the international prize of Sculpture and was elected a member correspondent (and received a gold medal) of the Academy of Letters and Sciences and Arts of Besancon in 1971. His work was acquired by numerous museums including the Musee de Paris, Dijon, Besancon Poutailier, and Arles.